From Full-face to Jet style. Enjoy six ways. Flip Up System equipped. Just only push the unlock button, you can enjoy the jet-style. 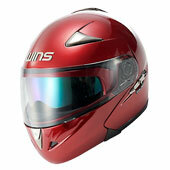 With dual visor, reduce the strong sun light. To get the air from outside, large-sized ventilation equipped. Its got impact absorption liner inside of cheek-pad for the more safety. With "CR-I" + "Shield for CR-Ⅱ" + Jet base kit, you can use it as "CR-Ⅱjet style"
have a broad outlook and convenience. 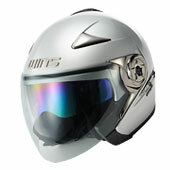 You can enjoy conversation, drink and eat with this helmet on. Hold your head tight with Face holding system. 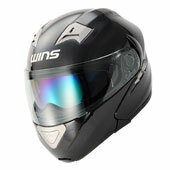 Equipped on push button Mouth ventilation and designed as sporty type for shell shape. With “Shield for CR-Ⅱ” + Jet base kit, you can enjoy jet style.